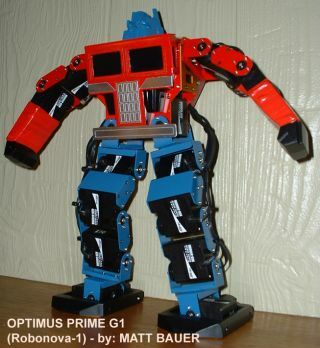 Optimus Prime Robonova: Doesn’t turn into truck; awesome nonetheless. Check out the thread in the TR Forums for bigger pictures and enlightening discussion. A few weeks back, we sold a KHR-2HV to I-Wei of Crabfu Steamworks. Let me tell you this: He has been putting his 2HV to good use. He put two walk test videos up on Youtube, and his considerable animation skills show through in his robot’s walking gaits. I’m really looking forward to seeing what else he comes up with. Maybe some steam/electromechanical hybrid projects? Please? Thanks to Lem at Robots-Dreams for breaking the story, Thanks to I-Wei for keeping us posted.